Nuclear Medicine is a branch of medical imaging which involves an injection of a small amount of radioactive tracer that shows the function and structure of the human body. This tracer has no side effects and will fully leave the system in 24 hours. Nuclear Medicine allows for early detection of diseases which may not be symptomatic at the time, as well as smaller bone fractures which may not be able to be detected with a CT or MRI scan. The radiation in the tracer is then detected by a camera which is known as a Gamma Camera. The Gamma Camera does move close to you in order to give the best possible image resolution, but it will not touch you. 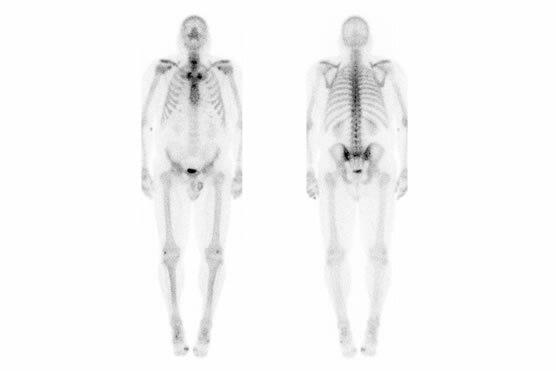 There are a variety of Nuclear Medicine scans that are offered at High St Xray. These scans may or may not involve preparation before your appointment. You will be advised over the telephone when making a booking as to the preparation required for your scan. Depending on when you make your appointment, you may be sent a letter in the mail which will advise of the preparation as well as the time and date and a brief description of what the scan entails. If you have received the letter and you are still unsure, please do not hesitate to call us on (03) 5441 9999. If you are severely claustrophobic, please advise the department when you make your appointment. If you are either pregnant or breastfeeding, please contact the department so we can explain what precautions will need to be taken, as the tracer can be excreted through the breast milk in some cases. A Nuclear Medicine scan can be quite relaxing! Depending on the scan you are having done, you just need to relax to minimise movement on the camera bed. As with all medical imaging tables, they are narrow and have a small amount of padding. A cushion can be placed under the knees to take pressure off the lower back, and the head pillow can be slightly raised if necessary. Depending on the type of scan you are having, this can range from 30 minutes to 4 hours (for delayed imaging). What are the risks of a Nuclear Medicine scan? Nuclear Medicine does involve an injection of a radioactive tracer. You should not notice any side effects from this and you can eat and drink as normal after the scan. We advise that, once you have been injected with the tracer, you should minimize your time spent with small children and pregnant women for the next 6-8 hours. As with CT scans, the number of Nuclear Medicine scans patients undergo is recorded, as is the radiation exposure received during these scans. In saying this, Nuclear Medicine is considered to be a safe medical imaging modality. Note that we perform scans on children and pregnant woman when clinically indicated. If you have any questions in regards to radiation, please feel free to contact us on (03) 5441 9999. The person taking the images is a fully qualified Nuclear Medicine Technologist. The Nuclear Medicine Physician reviews the images and prepares a detailed report for the referring Physician. The High St Xray Nuclear Medicine Physician provides the written report to your referring practitioner, either electronically or via fax. A Nuclear Medicine Physician is a Doctor who has specialized in the field of Nuclear Medicine.